Want to know more about Toronto’s Top Dog Fanny? We have the scoop with our one on one interview with the cities top pooch! Today we are talking to Fanny, Toronto’s Top Dog 2017-18. 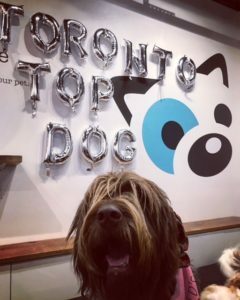 In December 2017 Fanny was crowned the cities top large dog but she also took the most coveted title of Toronto’s Top Dog 2017-18. 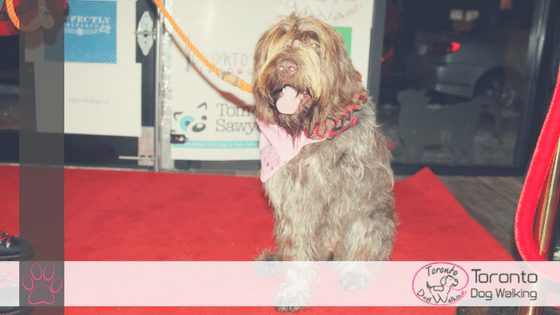 After hundreds of entries for Toronto’s Top Dog, Fanny made it to the top 28 dogs representing the large dog category. 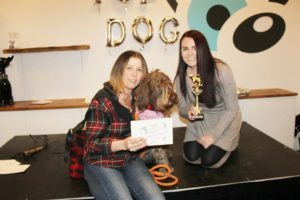 Fanny made it to the final of Toronto’s Top Dog by winning the hearts of the judges and the public, each were responsible for 50% of the total votes for all the doggos who entered. The judges were asked to judge the contestants based on their picture and more importantly why they are a proud Torontoian! 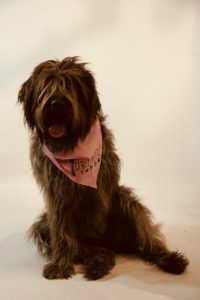 Fanny is a wirehaired pointing griffon who is one and half years old and volunteers for St. John Ambulance and visits seniors and students on a weekly basis and a spokesdog for Dogs of Corktown. She is also a tripawd dog who’s disability and amputation never slowed her down she is truly unique. So that is enough of me telling you about Fanny, let’s get to know this pawsome girl better! Hi Fanny! Congrats on being named Toronto’s Top Dog! Has all the attention gone to your head? My mum is pretty proud of me (she tells me everyday) but I try and keep it all in check and stay pretty cool… although I do dig all the extra pats! What was your favorite part about winning the contest? The best part was actually getting to go to the party and meet all the other Top Dogs and their people! I love making new friends most of all. You’re a very active dog between being a therapy dog, working with mom – what is a typical day like for a top dog such as yourself? I am very lazy and lay in bed until my mum’s coat is on and then she takes me and my uncle MacDuff to the park for an hour before work every morning. After that I go to work with her and get to say hello to all kinds of folks and pets and eat as many treats as I can charm! After work we go to the park again for another hour or two then have a nice dinner before lounging the night away on the couches. Is exercise an important part of your lifestyle? If so, how do you exercise, and why? I run around a couple of hours a day and on the weekends, we spend hours at the dog beach swimming digging and running…. missing a leg hasn’t lowered my energy levels at all! Can you tell us more about your role about being a therapy dog? How did you start working with St.John Ambulance? How can others join your cause? My Mum says she knew I had the personality to be a therapy dog as soon as we met at 7 weeks. Renee my breeder said she worked hard at making me confident and independent because she thought I would need it since I started out in life smaller than my siblings and with my leg not working right. To be a St.John Ambulance Therapy Dog you have to be a minimum of 12 months and have all your shots etc. I was tested as soon as I turned 1 and passed! After that you get to be mentored on visits to your assigned place (retirement home) for a time until you are assessed as ready to be there on your own. Once you pass that test, you get to visit your chosen home weekly and also attend special events and school visits among other things. It is all great fun. To get involved you can go to sja.ca for more information. How do you hope to inspire other dogs and humans? Do you have any advice for aspiring Top Dogs? As long as you stay true to yourself and your friends…everybody is a Top Dog! Wow that is a tough one… there isn’t much I am not a fan of… I can say I really liked the snacks at the Top Dog Party this year! My mum almost ate one by accident they looked so good! Meeting new friends and swimming in the lake! Sometimes after a big play… I go take a nap in the bushes and don’t hear my mum calling me. Fire alarms…. I don’t like fire alarms. Becoming a therapy dog of course! Wow!! That was a pawmazing fun interview with Fanny, who knew that being a therapy dog was a way of life and if you didn’t know already it really is a dogs life and Fanny is living it to the fullest! I hope you enjoyed getting to know Fanny and her mom! Fanny is a fantastic representative of our great city of Toronto. You can see more of Fanny and the other top dogs pawtying at Tom & Sawyer at the Grand Finale here. You guys have been doing amazing work! She totally deserves to be Toronto’s top dog and she looks super cute in the photos.